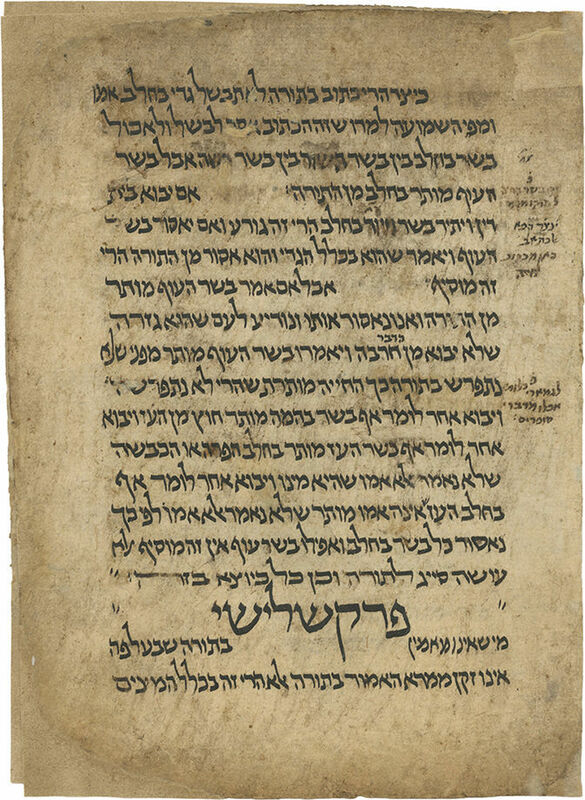 Seven leaves, fragments of an early manuscript, presumably from a "bindings geniza" – Mishneh Torah by the Rambam, Sefer Shoftim. [Early Oriental script, ca. 14th century]. Before us are two leaves from Hilchot Edut (laws of witnesses; Chapter 21, Law 5 – Chapter 22, Law 2), four leaves from Hilchot Mamrim (laws of rebellious ones; Chapter 2, middle of Law 9 – Chapter 4, middle of Law 3), and a leaf from Hilchot Melachim UMilchamot (laws of kings and wars; Chapter 6, Law 6 – end of Law 13). Several marginal glosses in early Oriental script. leaves. 23.5 cm. Overall fair condition. Varying degrees of damage. Tears and damage (some leaves were cut lengthwise, to fit binding, and reattached), professionally restored, with damage to text in several places.